One of the largest fire departments in Maine is suddenly without its leader. 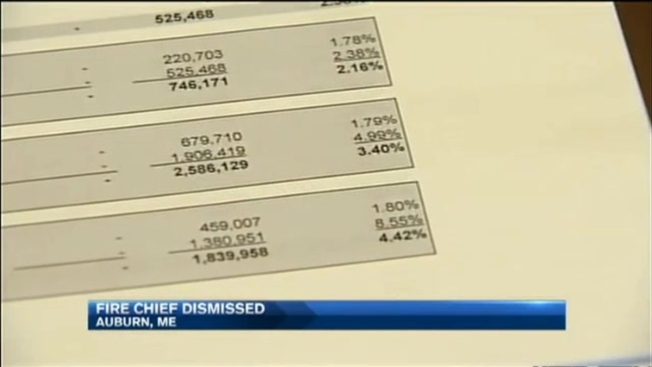 Last week, Auburn Fire Chief Frank Roma was laid off. According to the city manager, Roma's job was one of eight city positions that had to be eliminated due to budget constraints. "It was a no-win, and eventually it was employees that had to be the casualties," said City Manager Howard Kroll, who said he had to account for more than $800,000 in cuts. "We are paying for the sins of the past," Kroll explained, pointing to an extreme overestimation in the amount of money Auburn would raise in non-property tax revenue each year. Kroll said Auburn administration in the past made an error in the budget, and it's a problem he inherited. Kroll's idea is to merge the fire and police departments into one public safety department, and have one "chief" oversee both. He said the public should not worry about seeing a difference in service. "I didn't touch any firefighter or police officer [in budget cuts]," said Kroll. "Those are my boots on the ground." But some Auburn residents are upset about the loss of the chief. "Who are you going to call if there's a fire, if the fire department is getting laid off?" asked Auburn resident Cheyenna Baldwin. "I think if they're going to lay anyone off, it shouldn't be the people who come get us when we need help," said Auburn resident John Ethridge. As the Auburn Fire Department waits for a finalized city budget, the Deputy Fire Chief, Geoff Low, is the acting-Fire Chief. "We are going to try and manage as best as we can," said Low. "I think any time you lessen a service in any way, there is going to be some kind of impact." The Auburn City Council receives the budget proposal Monday night. There will be weeks of review, and time for public comment.